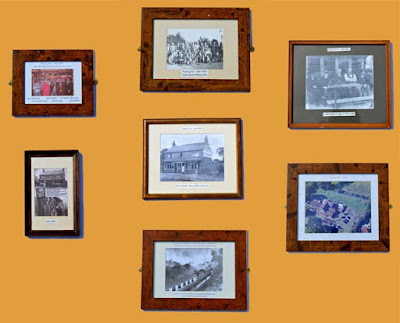 A local resident has recently come into the possession of a set of framed photos of images of The Peeping Tom. The framed photos had formerly been hung on the walls inside The Peeping Tom, and were removed during the refurbishment in 2016. The Peeping Tom is an important part of the heritage of Burton Green. The Peeping Tom acquired that name in the 1860s. But a building has existed on that site since the early 17th Century, and possibly earlier. The earliest known reference to the property is in 1607 when the property was sold for £160. 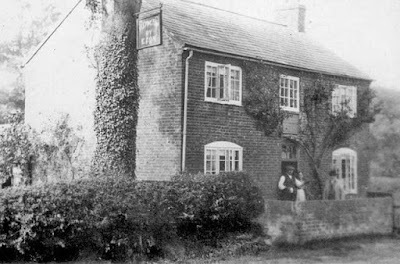 The property changed hands several times, and in 1802 came into possession of the Arnold Family who also gave their name to Arnold's Farm. From the 1841 census we can see that, at that time, the property was a smallholding. The property remained a smallholding up to and including the 1861 census. But by 1871 the property had become The Peeping Tom Beerhouse. So the property became a beerhouse sometime between 1861 and 1871. 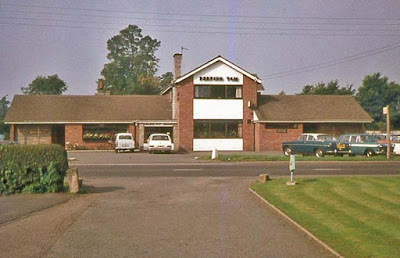 There have been claims that The Peeping Tom was originally opened to provide refreshments for workers constructing the Kenilworth to Berkswell railway. However, according to the Greenway Trust website, that railway was not built until 1882-1884, so the Peeping Tom Beerhouse predates the railway by at least a decade. The Peeping Tom in 1910. 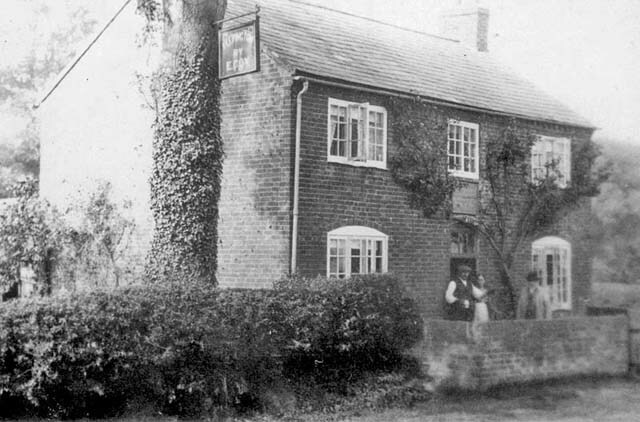 The pub sign on the tree, which may be difficult to read, says 'Peeping Tom by E Cox'. 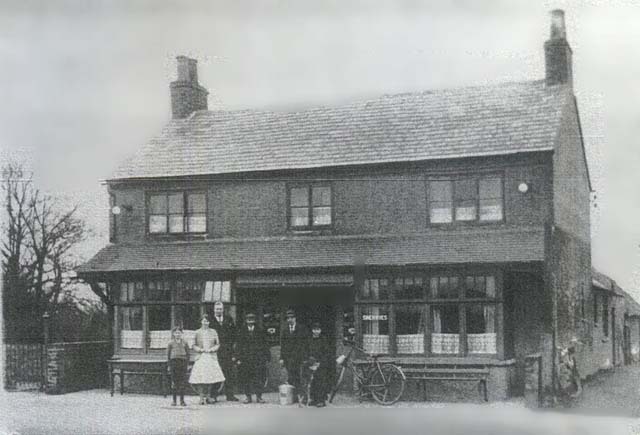 The caption on this photo stated 'Early 1900s', though the photo must be later than 1910, as this is clearly a different building to the 1910 photo (just above). This is probably 1920s. The 1939 census tells us that the landlord was then Herbert Cowley. This photo shows his daughter Amy, and wife Grace, standing outside, with Bert Cowley at the window. Also in the late 1930s. 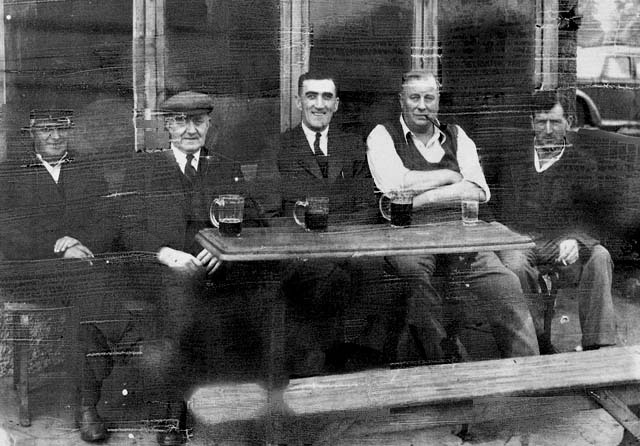 Bert Cowley is 2nd from the right in this photo. When Bert Cowley retired, the pub was managed by Amy Cowley and her husband, Charles Aston. 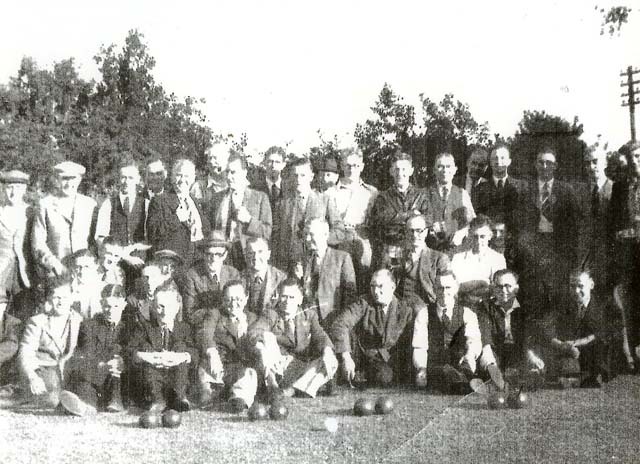 Early 1940s, the Crown Green Bowling Team. In 1972, after the construction of a brand new building. This photo was provided by Rick Jowett. 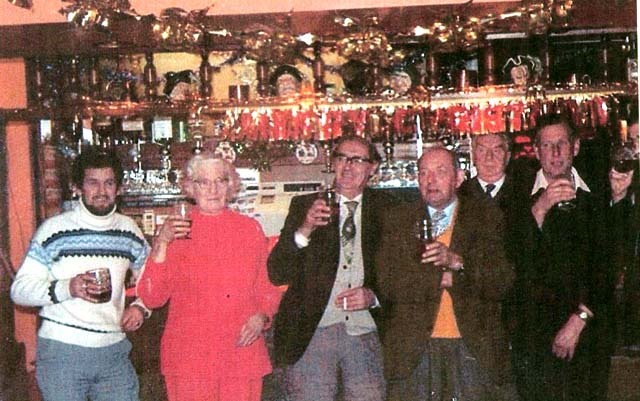 Staff and customers in the late 1970s. "Elements in the Godiva legend and other traditions relating to Coventry provide clues as to the nature of the original cult although any reconstruction must, in the absence of positive proof, remain conjectural. 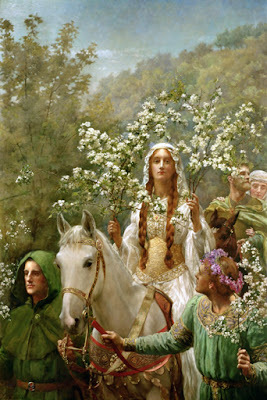 The naked woman with long hair, riding in a springtime procession, is the one constant factor in all variations of the legend and represents a goddess of fertility. The tabu element of the Peeping Tom story may be a genuine part of the original myth, recalling similar penalties for those who intruded on the forbidden rites of other fertility goddesses. Like the intruder in other tabu stories, however, Peeping Tom may have played a more positive part in the ritual, as the priest-king, the consort of the goddess who was sacrificed to ensure the fertility of the crops and herds, and well-being of the community." (not film) ride your own horse! 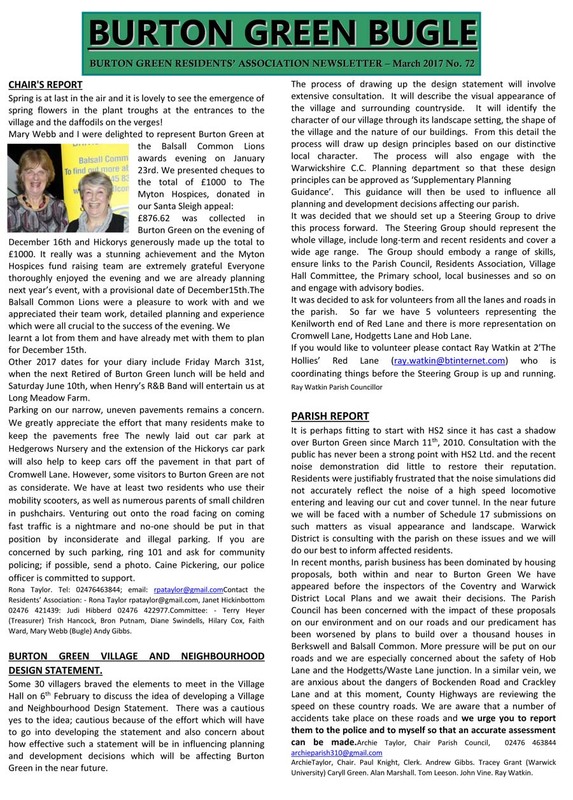 The March 2017 edition of the Bugle has been published. 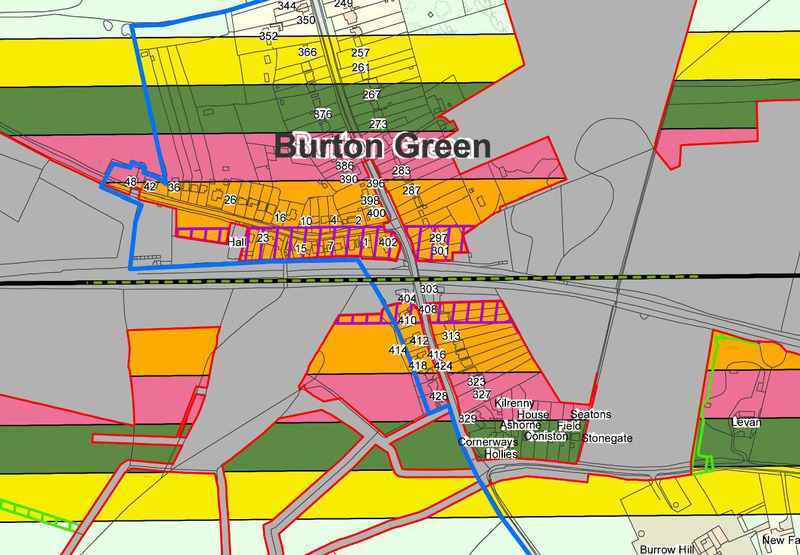 This concerns the proposed housing development within the Coventry City boundary at the Northern end of Cromwell Lane. 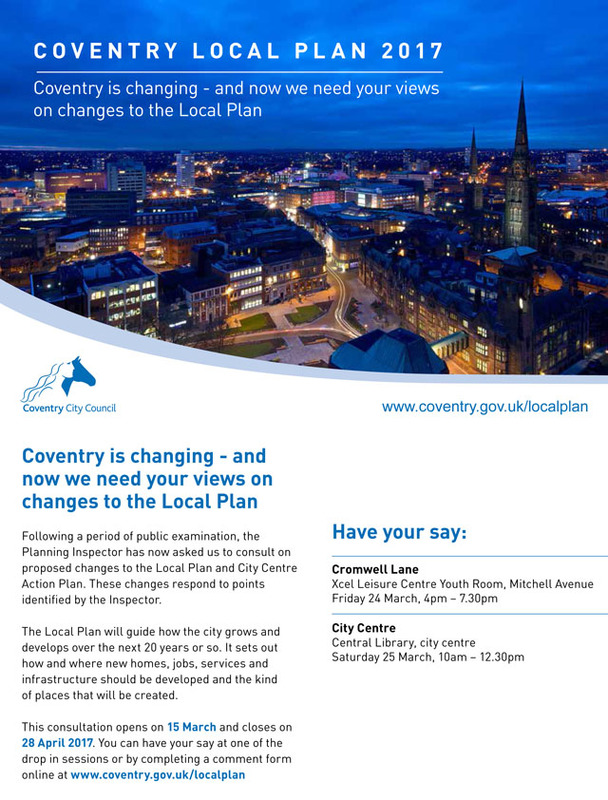 There will be a drop in session held at the Xcel Leisure Centre Youth Room, Mitchell Avenue (off Charter Avenue), on Friday 24 March, 4pm – 7.30pm. Dianne Adams, Trish Hancock, Judi Hibberd; Janet Hickinbottom; Bron Putnam; Diane Swindells, Faith Ward and Mary Webb. The minutes of the previous meeting of January 17th 2017 were approved. 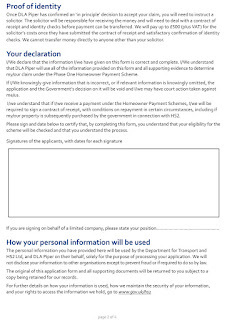 Approach PC for full costs of Bugle printing: Rona had not yet pursued this but would do so. Water problem and repairing damage in Red Lane: there had been an interesting presentation from Severn Trent. 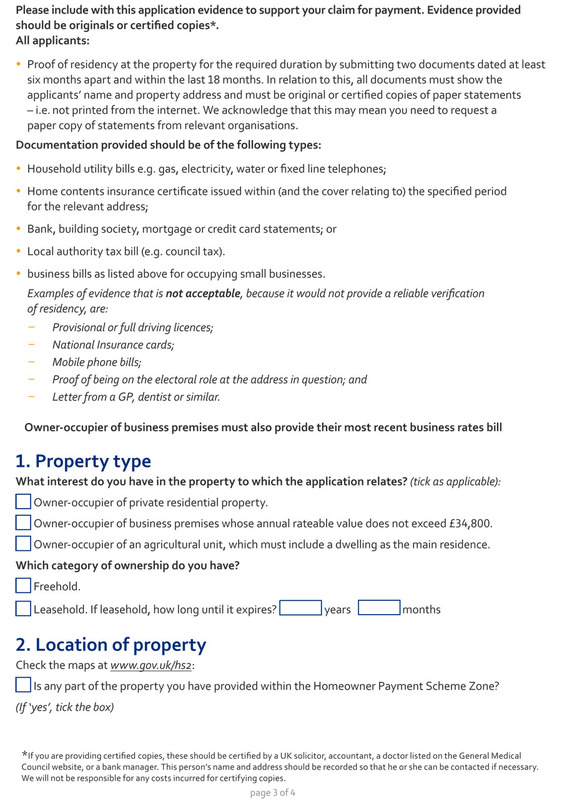 Community compensation: £500 had been received from Severn Trent and £200 from Western Power. It did not appear that individuals were eligible for compensation. A report had been circulated. Dianne went through the report explaining that income had been received from Western Power and Severn Trent and for the speed gun calibration. 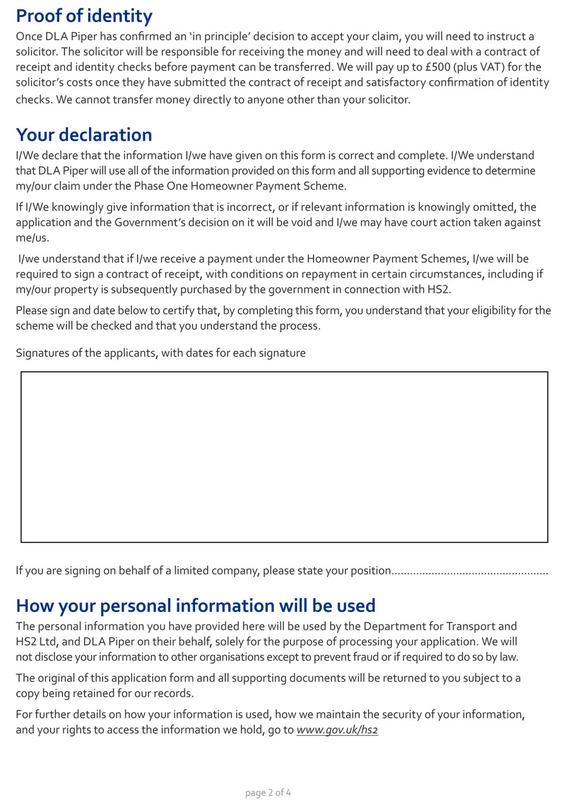 So far £40 had been paid in for bin stickers purchased. The only expenditure related to thank you gifts for those involved in the erection and maintenance of the Christmas tree and for the printing of the Bugle. Parking on pavements: Some damage had been caused to a car which had parked on the pavement during a children’s party at the Village Hall. Comments had then been made on Facebook. The Village Hall committee had responded to this and had put up signs asking visitors not to park on the pavements in the vicinity. Rona had agreed to invite the new community beat officer to meet with the Parish Council and BGRA. The September 2016 Bugle had requested people not to park on the pavements. 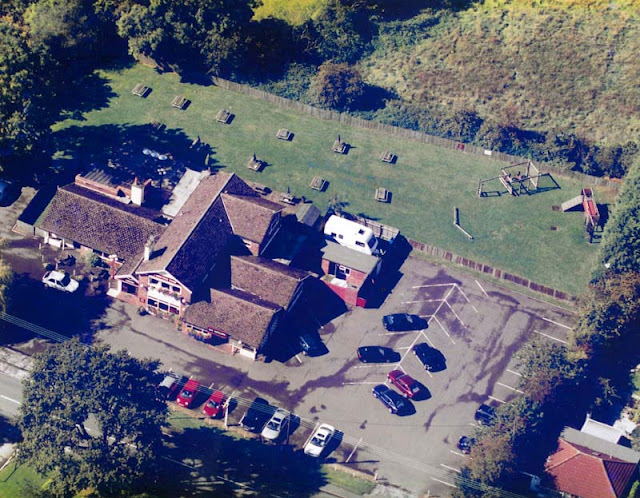 Hickory’s Smokehouse had extended its car park and had asked people to use this rather than blocking pavements. It was felt there was little more to do except remain vigilant. 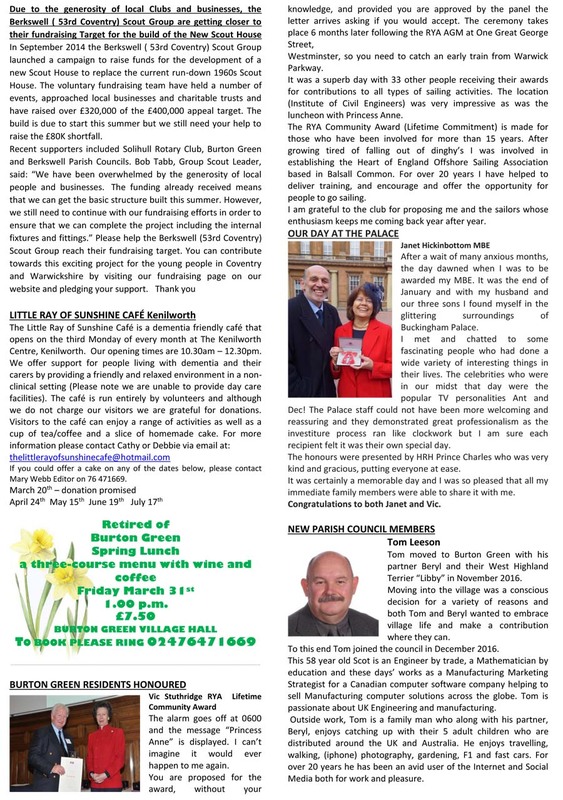 Lunch for retired of Burton Green, March 31st. Diane and Mary were organizing this at a price of £7:50 per head. 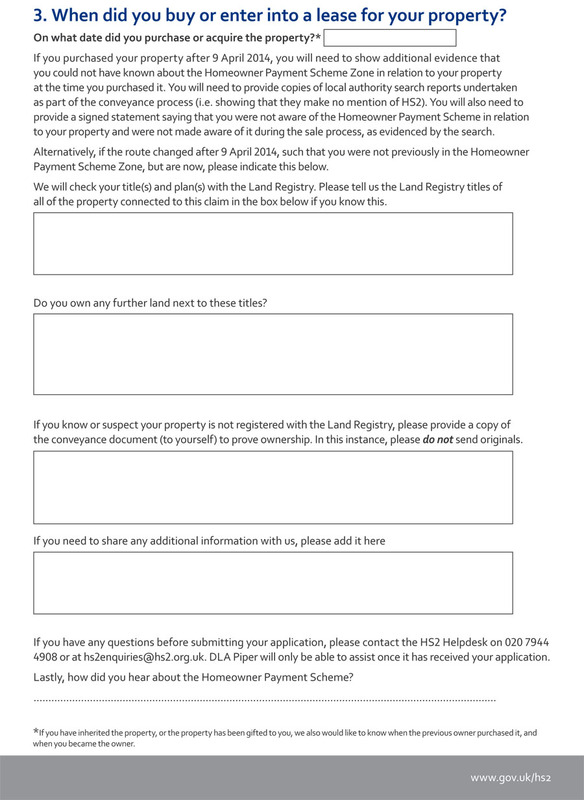 Crest Nicholson who hope to build 425 houses (with up to 40% affordable) on Westwood Heath Rd contacted the Residents’ Association to explain their plans. Mary and I met them on Feb 15th and pointed out that, whilst we were happy to listen to what they had to say, the RA’s position on housing is neutral and we leave housing decisions to the PC. 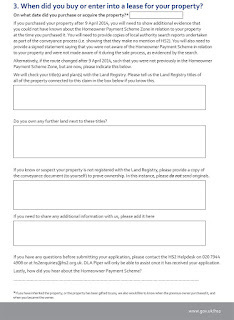 Crest Nicholson say they are keen to engage with the community of BG and have a provisional arrangement for an exhibition at the VH April 5th &6th following the inspector’s report which is due in March. They hope to submit plans in May, secure this permission by May 2018 and begin building within 9-18 months. Phase 1 would be 120-125 houses in the north end of the allocated land. Crest Nicholson say they take pride in place making, community building and quality. They have a mature strategic site In Daventry which we could visit and are currently building in Balsall Common where we could visit a show home. We talked about the Community Infrastructure Levy from which BG could benefit; this is £80 - £110 per square metre and Crest Nicholson expressed an interest in supporting the School and the VH. They are committed to building a shop on the site and want to provide a physical connection with Cromwell Lane through a current right of way. 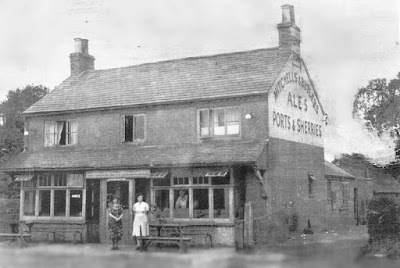 Mary and Rona had visited the site in Balsall Common. 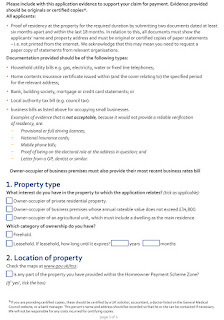 A brochure was circulated showing a variety of housing types. The Community Levy might amount to between £1.5m to £4.5m but this would be paid to the Council who would be responsible for its use. 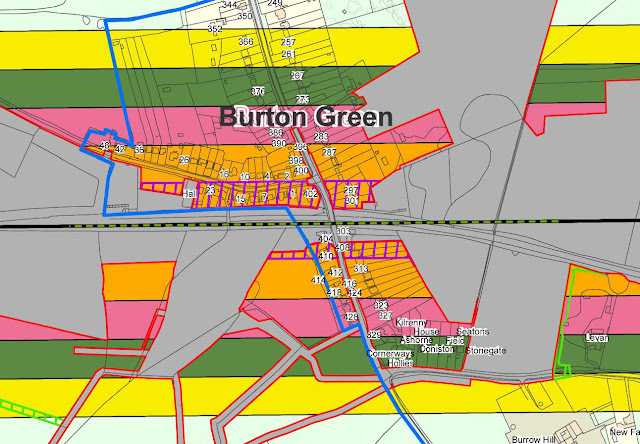 Cllr Green said Burton Green should receive a proportion. It was expected that the building of 425 houses would begin in March 2018. Community clean up: this would take place on Sunday March 19th. The issue of parking had already been discussed. 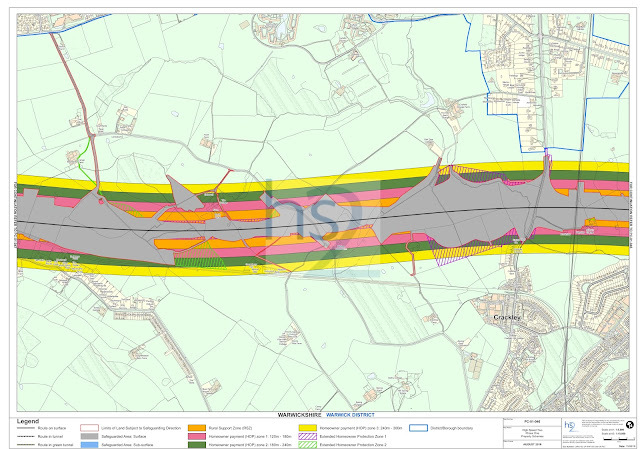 HS2 and new Village Hall: No formal agreement had yet been received from HS2. 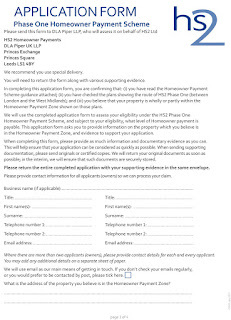 Carter Jonas had drawn up a valuation and recommended acceptance by HS2 but HS2 have to go to governance. 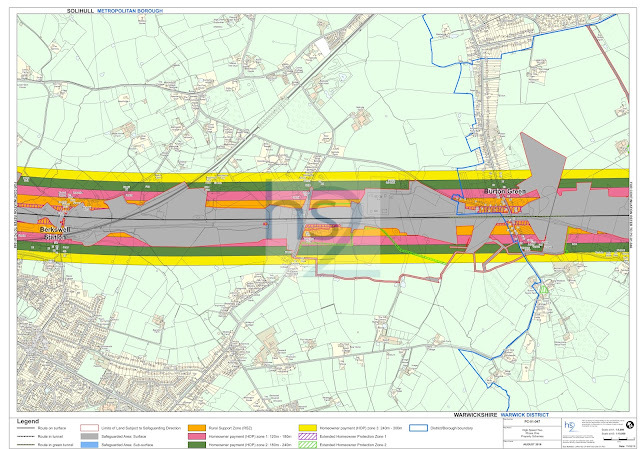 HS2 was still pushing for the Village Hall committee to go for planning permission. The new hall plans reflected the need to be generous which is what the Select Committee had advocated. There was to be a community funding meeting on March 21st at which BGRA, Parish Council and Village Hall representatives would convene to discuss such matters as the landscaping of the rest of the field. Pershore College students had done an assignment about the landscaping of the site and their ideas would be considered, though the costs were likely to be prohibitive. The Village Hall committee would need to talk to the neighbours of the new site once plans had been finalised. The new hall needed to be completed by 2018. In response to a question, Diane said solar panels were planned but not solar tiles. Many green measures were being incorporated. Very difficult conversations had been held regarding the mains sewer. Thanks were given to Diane and it was agreed the situation was very frustrating. No one was available to comment. Cllr Green said the Parish Council (PC) was looking at a Village and Neighbourhood Design Statement which would involve extensive consultation. A Steering Group was to be created with representatives from the whole village. 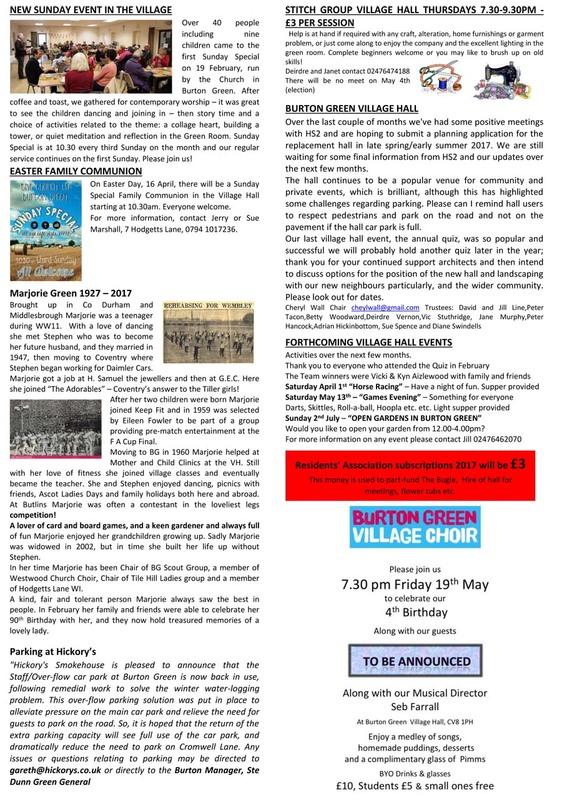 Details had been published in the current edition of the Bugle. 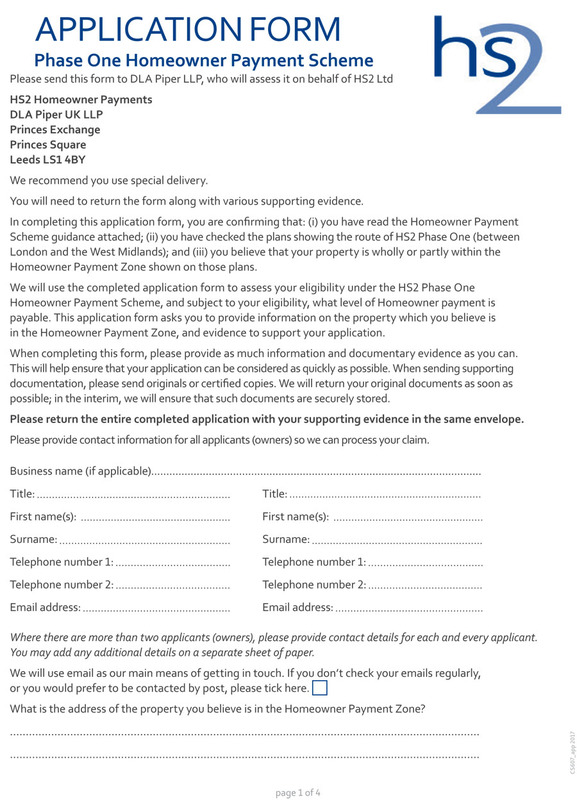 Cala Homes planned to submit detailed planning permission for the Burrows Hill site in late spring with a view to start building in 2018 and they had requested a meeting with the PC. It was hoped to include BGRA. There was a house in Cromwell Lane which appeared to be in the process of total demolition. Permission had been given for an addition at the rear. Planning department enforcement would only get involved once the demolition was down to ground level. 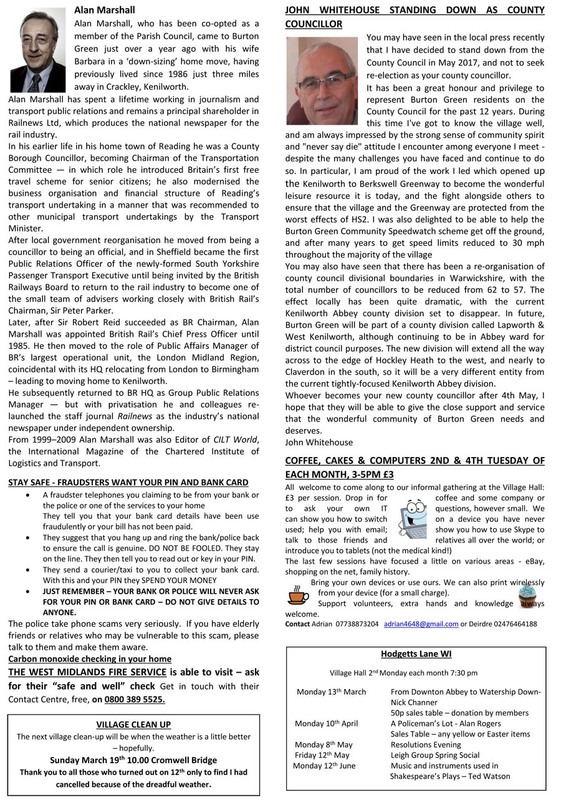 The PC Chair was very busy fighting against probable major developments including the 240 proposed houses adjoining the station, the Crest Nicholson site already discussed plus the Burrows Hill site. These developments would have a major impact on the traffic in the village. The various inspectors' reports were now awaited. Rona had received a letter from a former Burton Green resident who had been born at Westwood Farm in 1942. 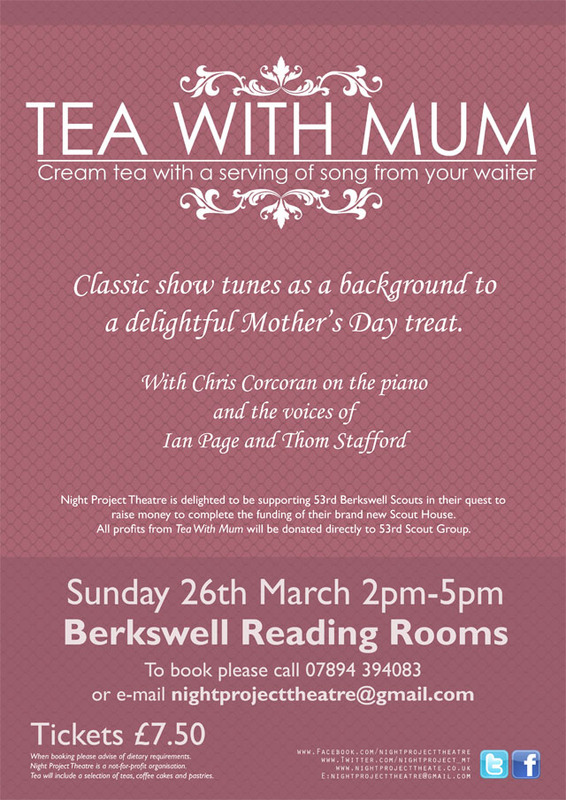 Committee members were reminded of the choir concert (with Pimms and puddings) on Friday May 19th. Was there any progress with the warden’s shelter in Red Lane? The PC had been asked but no decision had been reached yet. What would the cost be to prune the ivy and make good the brickwork? A comment was made on the lovely fencing round the playground in Red Lane. When a query was raised about a pothole outside school, information was provided that Solihull MBC had put cones around it and the PC had agreed to pursue the matter. The next meeting would take place on Tuesday May 9th 2017. 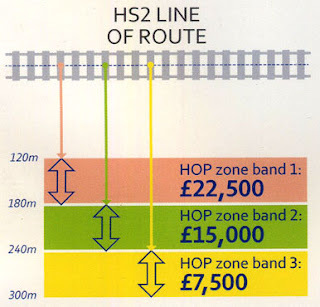 Residents may have recently received some propaganda from HS2 Ltd about the plans for a proposed railway line. There are some more realistic reports in the media today (3rd March) about gross incompetence and bungling by the Department of Transport and Network Rail which are evident in the current attempt to upgrade the Great Western Railway.